What if we really believed God is uniquely present and active in the circumstances of each of our lives, speaking a word? What if we truly believed there would be a fulfillment of the word spoken? What if instead of allowing our circumstances to determine what we believe we allowed our believing to reinterpret the circumstances? That would be blessed believing, Elizabeth and Mary type of believing, the kind of believing that gives birth to new life. 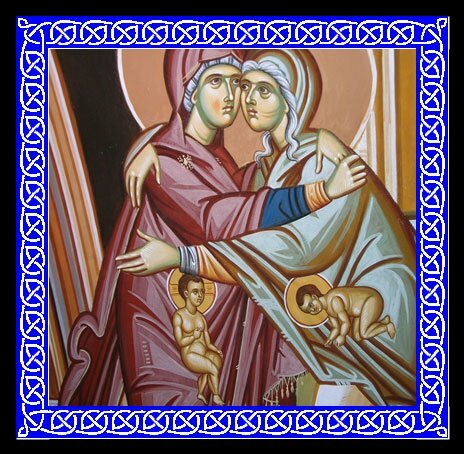 That believing is at the heart of today’s feast, The Visitation of the Blessed Virgin Mary (Lk. 1:39-57). Two pregnant women, neither of whom, according to their circumstances, should be or could be pregnant. One is too old. One is too young. One is barren. One is a virgin. Yet, both are pregnant. Neither Elizabeth nor Mary allowed the circumstances of their lives to define who they were or limit who they might become. Believing for them is not so much about what they see but how they see. Each one believed she was more than the circumstances of her life. Elizabeth believed she was more than just a barren, childless, old woman. Mary refused to accept that she was a no-one, another scandalous woman, but believed that she was the mother of the Holy One. Both woman saw, hidden within their particular situation, a deeper meaning and a new life. They believed through the circumstances of their lives. Each one trusted that the God of the impossible was somehow in the circumstances reshaping, transforming, and fulfilling her very existence. God was at work within these two women changing them not their circumstances. So it is for each one of us. This is very insightful to me. I have never relected on the theme of believing this Gospel pericope. As I was reading this, it came to me who I want to be for my family. I’ve been pitying myself and blaming members of my family this weekend. I don’t have to have the circumstances of our past determine who I am for them now and in the future. Narelle, it sounds like something new is being born in you. You are in good company with Mary and Elizabeth. May their prayers support you and your family.